The IQAir Multigas removes chemicals and odors from the air. 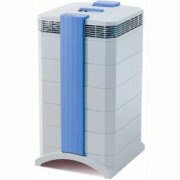 This air purifier will remove harmful VOCs including formaldehyde from the air. It is perfect for people with Multiple Chemical Sensitivities. Not only does this filter remove chemicals it also does a fantastic job of removing particles from the air. It retails for $1150. These air purifiers use activated carbon and alumina. This cartridge is used to remove chemicals and odors from the air. It has a pre-filter to remove any larger particles from the air. There is also a post filter that will trap any remaining particles. This makes the IQAir Multigas great at particle filtration too. The pre-filter is about $70. It will last 6 - 18 months. The post-filter is about $96. It will last 1 - 2 years. The GC gas cartridge is about $295 and it will last 1 - 3 years. It is hard to say exactly how long each filter will last. It depends on the environment. So your cost to maintain this air purifier will vary. To find a ballpark figure, we assume a pre-filter will last 1 year, the post filter 2 years and the GC gas cartridge 2 years. This would give us an average cost of $265 each year. It has a programmable 6 speed fan. It can run at different speeds at different times of the day. The Multigas is 28 inches X 15 inches X 16 inches (H X L X W). It weighs about 40 pounds. It has a 5 year warranty that covers defects in parts and labor, but not filters. Allergens: Mold spores, dander, dust mite allergens, and pollen. Odors: Pet smells, cooking smells, musty smells, and paint odors. Other: Tobacco smoke, wild fire smoke, smog, and other pollution sources. We feel that the IQAir Multigas Air Purifier is an excellent machine. It will work great for people with multiple chemical sensitivities. It removes a wide range of chemicals. We are also happy to note that the Multigas also provides excellent particle filtration. We are impressed because this machine filters out chemicals and allergens. Leave IQAir Multigas Page and Return to IQ Air Purifiers Page. Leave IQAir Multigas Page and Return to All About Air Purifiers Home Page.